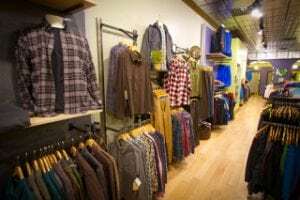 When you walk into Ramble on Pearl, located on 16th and Pearl Street in downtown Boulder, Colorado, you see a wide range of premier active lifestyle clothing. You see high-end interior design. You see a retail business. But Ramble on Pearl is not in the retail business. 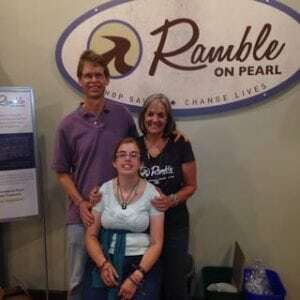 Ramble on Pearl is in the changing lives business. Ramble on Pearl is operated by the non-profit organization Boulder Treasures, founded by Andy and Connie Minden. Their story is one that shatters perspective, it awakens what truly matters in life, and it realizes possibility and opportunity. Ramble on Pearl is the storefront of a mission conceived out of frustration. Andy and Connie moved to Boulder hoping it offered the life they envisioned for their daughter, Kendra, who has developmental disabilities. 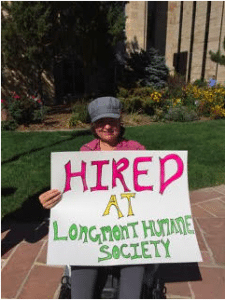 While in many respects Boulder seemed an ideal community for their daughter, frustration swelled from the fact that Kendra and her peers were struggling to find jobs, though perfectly capable of independent employment. Two months after that retreat, the beginning concept of Boulder Treasures was launched and they were on the path to incorporation and setting up their store and apprenticeship program. 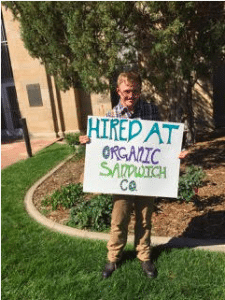 At Ramble on Pearl, job coaches train hard and soft job skills as a pathway to independent employment in and around the Boulder Community. The Minden’s held Boulder Treasure’s four-year anniversary since formally launching their apprenticeship program only a couple weeks ago, where present students, graduates, brand partners, and board members converged inside Ramble for an evening of celebration. Students and graduates seemed to take turns all night hugging Andy and Connie, each with a squeeze cemented by gratitude. Andy and Connie eventually broke from hugs long enough to get up in front of the crowd for an outpouring of their own gratitude. Connie’s hands didn’t leave her heart in an emphatic message that Ramble on Pearl could not go on without the Boulder community. Ramble on Pearl is able to place graduates in jobs that fit their skill set and enjoy long-term success thanks to willing and open-minded employers. And they are able to offer brand new, high-end apparel at prices customers can’t find elsewhere thanks to donations from a long list of brand partners. Connie, you mentioned this kind of revelation on the retreat. How soon after that retreat did you start Boulder Treasures? Connie – Very quickly, two months or so. After that retreat, I started to think about what kind of form this could take. I knew, as a teacher, I wanted to have some kind of classroom setting where we could teach those skills but I wanted to be an on-the-job classroom, a real world setting. That just didn’t exist. So I started to think about what kind of business we could have where we could teach those skills. I was at this warehouse sample sale at Krimson Klover here in town and I talked to the owner Rhonda Swenson and told her what I was thinking about doing and if she thought this could ever fly – that I could have a business that sells clothing and teaches this population. I asked if she’d have any interest in partnering with me and help with lower prices on product so we’d have a source of revenue to help fund the project. She absolutely loved the idea! 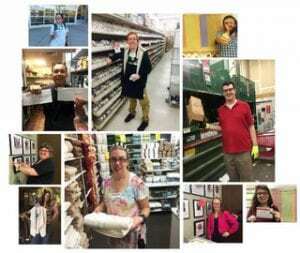 It’s really amazing how many people in your everyday life have some connection to somebody with a developmental disability. She immediately told me she has a niece who hasn’t had any such opportunities, even though she’s bright and she could hold down a job, there’s just nothing there for her in her community. So she said she would love to be a part of something like this and making a difference in adult’s lives here in Boulder. She donated a bunch of her off-season product. I talked to a few other clothing companies in town and they wanted to donate too. So then we said, okay, I guess we should find a space. Wow so things really lined up quickly. If you look back on it, does it feel like a calling of sorts? It’s amazing to me how quickly things perfectly seemed to fall into place? Andy – Absolutely. And it wasn’t just that but also we applied for and received a grant of pro bono consulting advice from Social Venture Partners of Boulder, which helped us establish our business model, the details and all that. We also met with Greg Wellems, the then Chief Operating Officer of Imagine!. 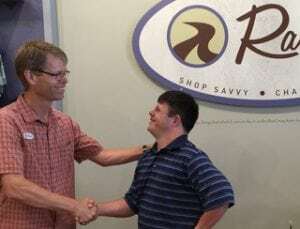 Originally, we thought we were going to hire a few people with developmental disabilities and that would be it – we would train them, teach them how to be great employees and that they’d be a part of the staff for our business. Greg had the idea of you training them at our store and then sending them out into the community because we could impact a lot more people that way. So that was the origins of the apprenticeship program. That’s part of what I think is so wonderful about Boulder is the network of people. At that point, it wasn’t like we had a huge number of connections, we weren’t established community members, but the help from the community was amazing all the same. 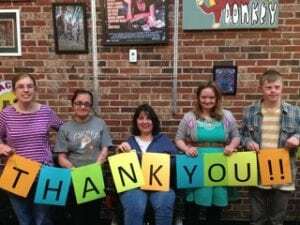 While we were waiting for the IRS to grant us our nonprofit status, we were able to raise donations to help fund what we were proposing through Imagine! who agreed to be our fiscal sponsor. And then the sister of one of Connie’s good friends from church, runs a design firm in town that designs retail stores (3 Dots Designs). Once we found a location, she offered to design it for free. And she knew other retailers who wanted to donate product and suppliers willing to offer discounts to build out our store. So it was very much a community effort. So many people came along side us to provide their insight and help where we needed. 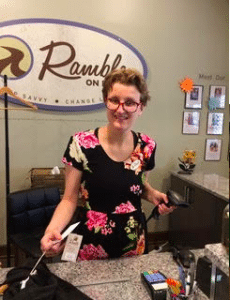 Connie – And when we first conceived the idea of a store, we were just thinking of being an off-price outlet store and we were going to have past season product but as we first opened Ramble, it just didn’t feel right. One of the goals we had as a couple and as a board was to open people’s eyes to the possibilities that this population brings to the table. It felt like we were just another consignment-type shop or thrift store. We really wanted people to see our apprentices in a beautiful, upscale boutique. People thought we were kind of a used clothing store, and we still fight that image. But with brand partnerships where our suppliers offer us discounts on regular wholesale prices in support of our mission, we’re able to offer entirely in-season, brand new clothing. It just continues to floor me the generosity of people. And are you seeing a change in employer’s willingness to hire your students? Connie -Yes, that also continues to floor me, just the open-mindedness now of hiring our apprentices. Once one organization hires an apprentice, it snowballs because that employer will tell others that our graduates are loyal, hardworking, and are fun to have on staff. A lot of people just don’t have exposure to people with developmental disabilities, so there’s sometimes a fear or a hesitation and a lack of understanding for what the potentials are. To overcome this, a key part of our program is that we provide a job coach that goes alongside our graduates in their future place of employment to assist in training their new employee and act as a liaison with the rest of the staff in that transition – helping the staff learn and feel comfortable. But once one of our graduates is placed in a certain job, it changes the whole culture of the company. I’m curious about whether you kicked around other ideas, or did you know retail was the best vehicle for your business model from the start? Connie – It was retail from the start. But one of the things we’ve learned from our apprentices, well people in general, is that some people, regardless of whether they do or don’t have a challenge in life, are intimidated by the idea of working in a retail store where you have to interact with strangers all the time,. So one of the things that we are in the development stages on is setting up a satellite program in a work environment where we can still teach those soft and hard skills of employment but in a different environment where you don’t have to deal with a constant flow of strangers and the social anxiety that can come with that. We are exploring different business environments like shipping and fulfillment warehouses because there are so many of those in Boulder and the surrounding areas. We believe this could lead to a lot of job opportunities for our graduates. We just want to provide options for our students to be in an environment where they can thrive and be successful because it’s not the same for everyone. Andy – One of the things that helps us all succeed at a job is a comfort level with the people we work with. So if you’re part of a team that works in a warehouse facility, for example, you can establish relationships with people you trust and build that comfort level. We’re also looking at other business models, like senior centers and assisted living facilities where there’s so much these two populations can offer to each other and building those intimate relationships would be really good for both. You said at the anniversary party that the success rates have far exceeded any original expectations, is part of that proving what you knew all along that these individuals just need the opportunity? Connie –Yes, it’s partially that where once given the opportunity, they will be successful. It’s also being particular about where we help our graduates secure jobs, making sure it’s the right match for their skill set and the right match culturally with a business that is open and accepting. That’s a huge part of the success equation. And along the way we learned, we can’t just get them started in a job and disappear. So we check in, not just with the graduate, but with the employer as well to make sure there are no issues and if there are, we want to step in early and nip it in the bud before it becomes a bigger challenge. Are you seeing progress outside of Boulder with similar opportunities for this population? Have people reached out to try to do something similar in other parts of the country? Andy – People have reached out. And we’re always open to offer guidance and talk about what we’ve learned along the way. One of the great things about Boulder is people come here from all over the world. 30-50% of our sales are to out of town visitors, from all over the world. So what we try to do as best as we can with everyone that comes in the door is share the fact that we are not just a clothing store. It’s not always obvious to a customer coming into our store, so we tell our story and what we’re trying to accomplish to everyone we can. Usually people are intrigued by that and say they wish they had something like it in their town. By the same token, it’s not to say we’re the know-it-alls in this area or that we haven’t learned from others because we absolutely have. There are people doing really great things in this area elsewhere and we’ve flown around to connect with those businesses. Along the way we have learned so much from others. Last thing from me, is there an ask of the community, anything the people of Boulder can do to support this incredible mission? Andy – A few. As we’ve said, most of our graduates do take jobs in what are considered entry-level positions. And as most employers know entry-level positions have, generally speaking, very high turnover rates. The average tenure of our graduates is something on the order of 20 months. Considering the fact that some of our graduates just finished, just landed their jobs maybe six, nine months ago, so it’s still early, but it’s growing. And we have plenty of employers of our past graduates that’ll readily say, “yeah, do it, hire their graduates.” So we’re looking for employers willing and open minded enough to consider adding one of our graduates to their staff. Often it may be that their preliminary vision of a job may or may not be an exact fit, but often with a little bit of tweaking of responsibilities, it can be a perfect fit. Then you have an employee that becomes a very happy, supportive, productive, long-term staff member. Connie – The other thing of course is shopping at our store because that’s what keeps us going. As a nonprofit, about 40-45 percent of our funding comes from the retail operations. 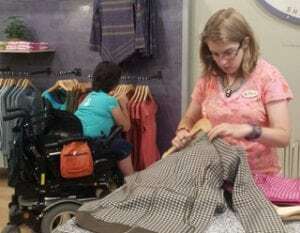 We get an additional 30-40 percent from the Colorado Division of Vocational Rehabilitation, but we’re still a nonprofit so donations are a great boost. Coming up this December is Colorado Gives Day, which is an opportunity for Coloradans to support their local nonprofits. So if you participate in Colorado Gives Day, please remember us and consider supporting Boulder Treasures – or if you can’t wait till then you can always send us a donationnow! This entry was posted by Andy Minden in Press.